The Farm School is offering 4 exciting new fellowship positions in 2018! Two of the new Fellowships available from The Farm School invest in training and mentoring the next generation of farm-based education leaders. The focus of the fellowship is on developing practical agricultural skills, production experience and exposure to The Farm School’s nationally recognized Program for Visiting Schools. 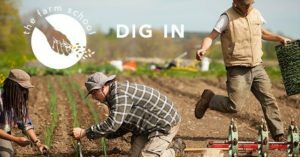 The Farm School will award up to two full scholarships (including tuition, room and board, books and materials) to our year-long practical training in sustainable farming to compelling applicants who communicate a clear vision for connecting young people to the land through farming. They should also demonstrate that they possess leadership potential to either start a farm-based education organization in the future, or to manage and shape an existing program at another institution. One full scholarship is available for a uniquely bright and compelling student representing an underserved community. The recipient of this fellowship should have great potential to serve or lead that community agriculturally. This scholarship carries the full value of the student farmer tuition contribution, including room, board, books and materials. One full scholarship is available for a student who identifies as African American/Black, Hispanic/Latinx or Indigenous and who demonstrates particular promise to make good use of the Learn to Farm Program’s agricultural training. This scholarship carries the full value of the student farmer tuition contribution, including room, board, books and materials. The closing date for these fellowships is FEBRUARY 15th SO DON’T DELAY! Click HERE for more information on eligibility and how to apply. announcing our BIGGEST EVER events schedule in 2018! !